Subex will host a conference call at 3:30 p.m. IST on May 26, 2017 to discuss the results for the fourth quarter and full fiscal year. Surjeet Singh, Managing Director and CEO will participate on the call. Subex operates out of India, US, UK, UAE, and Singapore. BENGALURU, INDIA – Subex Ltd, a leading global provider of Business and Operations Support Systems (B/OSS) for Communications Service Providers, today announced its financial results for the year ended March 31, 2017. Surjeet Singh, Managing Director & CEO, Subex Limited said, “The Company achieved industry leading growth rate during the year with improved operational profitability through concerted efforts in the market place and internal operations. We have also successfully completed the balance sheet restructuring of the company and are debt free. As the business of our customer continue to change we at the forefront in making necessary investments in our portfolio ahead of time to innovate with them . MUMBAI, INDIA – Subex Ltd, a leading global provider of Business and Operations Support Systems (B/OSS) for Communications Service Providers, today announced its financial results for the third quarter ended December 31, 2016.  The company won two large long term managed services contracts from global telcos for multi-property offerings for its assurance and partner management suit of offerings.  The contracted book of business improved to ~ US $ 140 million while the total pipeline increased to ~ US$ 230 million. The company pioneered the concept of a Revenue Operations Centre (ROC®) – a centralized approach that sustains profitable growth and financial health through coordinated operational control. 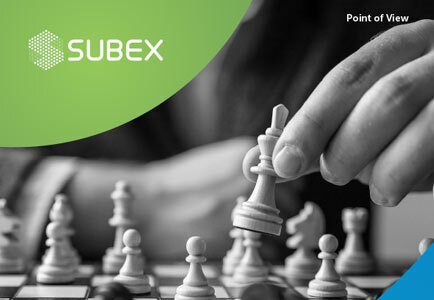 Subex’s product portfolio powers the ROC and its best-in-class solutions such as revenue assurance, fraud management, asset assurance, capacity management, data integrity management, credit risk management, cost management, route optimisation and partner settlement. Subex also offers a scalable Managed Services program with 30 + customers. MUMBAI, INDIA – Subex Ltd, a leading global provider of Business and Operations Support Systems (B/OSS) for Communications Service Providers, today announced its financial results for the second quarter ended September 30, 2016. BENGALURU, INDIA – Subex Ltd, a leading global provider of Business and Operations Support Systems (B/OSS) for Communications Service Providers, today announced its financial results for the first quarter ended June 30, 2016. Fund based limits: upgraded to Long-term ‘IND BBB+’/Stable from ‘IND BBB/Stable‘. Subex has been awarded the Global Market Share Leader in Financial Assurance 2012 by Frost & Sullivan and has been the winner of Pipeline Innovation Award 2016 in Security & Assurance and in 2013 in Business Intelligence & Analytics; Capacity Magazine Best Product/ Service 2013. Subex has continued to innovate with customers and have been jointly awarded the Global Telecoms Business Innovation Award 2014 along with Telstra Global; in 2012 with Idea Cellular for Managed Services and in 2011 with Swisscom for Fraud Management. BENGALURU, INDIA – Subex Ltd, a leading global provider of Business and Operations Support Systems (B/OSS) for Communications Service Providers, today announced its financial results for the year ended March 31, 2016. Out of the total outstanding of Rs. 492 cr, Rs. 447 cr bonds have been converted to equity, thereby reducing the long term debt to insignificant levels. On account of this conversion interest of Rs. 104 cr which was provided is now reversed, since it is no longer payable. Post the conversion the net worth of the company on consolidated basis is Rs. 727 cr as against Rs. 209 cr as at year end March 31, 2015. Major thrust on Managed Services over the last few years growing from under 15% to above 35% to create sustainable platform based services with long term contracts. US$ 51million of new business won in FY16 as against US$ 45 million in FY15. Contracted revenue stands at all time high of US$140 million aided by long term Managed Services contracts. Surjeet Singh, Managing Director & CEO, Subex Limited said, “I am pleased to report that with relentless efforts over the last couple of years under the sound guidance of the board, Subex has been able to convert majority of its FCCB debt into equity. With this, the long term debt overhang and related interest cost on the balance sheet of the company is substantially removed. This was a complex process and is a significant milestone for future of Subex as this shall provide much needed avenues for investments in the core business and enable long term growth and enhance shareholder value. MUMBAI, INDIA – Subex Ltd, a leading global provider of Business and Operations Support Systems (B/OSS) for Communications Service Providers, today announced its financial results for the third quarter ended December 31, 2015. MUMBAI, INDIA – Subex Ltd, a leading global provider of Business and Operations Support Systems (B/OSS) for Communications Service Providers, today announced its financial results for the second quarter ended September 30, 2015. Surjeet Singh, Managing Director & CEO, Subex Limited said, “We have ended the quarter with an increased EBITDA as well as Profit after Tax. Our recently concluded Subex User Conference 2015 is testimony of our solutions capabilities and assurance of our customer’s support and belief in the company’s strategy and growth. As the industry continues to focus on enhanced efficiency and reduced capital expenditure, the prospects of Subex continue to be brighter than ever, indicating better performance ahead with our clarity of purpose and mission of stability”.